Offering excellent value in smartly-furnished surroundings, the Hotel Palma Nova Palace is a very popular choice for couples of all ages. Just back from Mellorca Palmanova Palace hotel. Looking from the outside it looks pretty good but on closer inspection was a let-down. Firstly when you arrive you are met with a sign free Wi-Fi in the reception area next visit to reception Wi-Fi is charged at 5 euros a day. Then you are booked in and allocated a room ours was 116 just along from the dining room on first impression it looked good air conditioned and spacious. Then you get to the fixtures and fittings, the curtains were torn the bed spreads had holes the wardrobe was damp due to it backing on to the bathroom the sliding doors did not slide. The fridge did not work. The bathroom mirror was chipped the door was water damaged. More importantly the towels were changed regularly but the sheets were not changed once and the weather was 26 degrees at night not very hygienic. That is just the room. As for extras the kettle if you want one is 10.99 euros hire per week no tea or coffee making in the rooms. The remote for the TV is also an added extra chargeable. For a four star all inclusive holiday value for money it was not and as for the pool I've seen bigger postage stamps and the lifeguard is a jobs worth don't splash as you may get wet. Hotel was great, good location, food excellent. The only drawback was the young people that started to arrive and were loud, swearing extremely drunk. They had to bring in security people to try and get them to calm down. The holiday was a bit of a let-down after all the 18~ 30 crowds started arriving. When we were leaving on the Saturday 12th there were more of the young ones than older people, we were glad to be leaving when we did, so many people were complaining to the hotel staff about the noise at 4 or 5 in the morning when they were returning from the nightclubs. The rooms were cleaned everyday. The food was OK one day then next day bland and you were having to wait because they had run short of various food and it was chips with everything. You had to queue every breakfast and dinner for 10mins and it looks like its short staffed. Before you had finished your meal the staff were taking your plates away giving you the impression they wanted you to vacate. The hotel is away from the main resort and next to busy road. The entertainment was the usual hotel stuff, the staff tried hard. The sunbeds, you had to be up at 8am to secure the best places on what was a small area. Stayed here for 6 days, hotel clean, friendly staff but food same every day and very little sunbathing areas. Entertainment very poor. There is ramped access to the front and a wooden ramp that leads to the bar and pool area but despite what some company's say there are NO DISABLED ROOMS or a disabled toilet anywhere in the hotel so keep away if you need these. Food not up to 4 star standard. Orange Juice was the concentrate stuff and not pure juice, baked beans were watered down. A Chef carvery only twice per week, not as much choice as we have had in 3 star hotels we have stayed at. The food on offer was on the whole OK and hot. Hotel is 2 min walk from the beach - excellent location. Entertainment non existent unless you like bingo and karaoke. Same 2 visiting acts per week, not worth staying in for. There is better live entertainment at other hotels and bars along seafront. When we were there the majority of guests were British, and they were all queuing for sunbeds at 0800am every morning. The terrace area is not big enough for all guests to fit in and there are not enough sunbeds for everyone. Counted at least 15 broken sunbeds and there was no attempt made to repair or replace these. The pool is approx. 45 feet by 20 feet and depth from approx 1 ft to 6 ft 6" at deepest end. Half Board has to pay for drinks with evening meal. the all inclusive was good seeing as a few days before we went home our money was stoled from our so-called safe! Three other rooms had money stolen aswell. Food was average, really close to the beach which was good, staff basically accused us of lying and didnt help one bit and we didnt even see a manager, the entertainment was poor bingo was every night. i wouldnt recommend this hotel to people. We used this hotel about 15 years ago. A lot has changed in this time. The room we were allocated was on the small side. The furniture and decor were dated and needed refurbished. The wardrobe was only just big enough, but there was very little drawer space for our things. The bath enamel was badly chipped and looked awful. The food was a big disappointment, as this was a big plus the last time we stayed here. During our stay a lot of youngish people arrived. This is not normally a problem for us. But unfortunately there was a lot a noise late at night. I mean really late. We are not early-to-bed types! Thomas Cook reps were staying at the hotel and they were commented on the commotion they experienced. Would stay here again, definitely not !!! 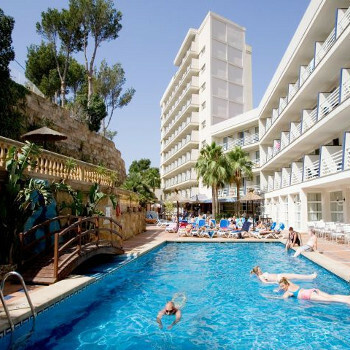 we have just come back from a 2 week holiday at the palma nova palace unfortunately the weather was not too good but we still enjoyed it company was excellent and the entertainers were first class keeping us entertained even though it was raining. Food and cleanliness was of a good standard and the staff were friendly in the bar area and the reception.